After public outcry, the United States has granted a visa waiver to a Yemeni woman whose dying son is on life support in the US, the family’s lawyer said on Tuesday. Shaima Swileh is expected to arrive in California’s Bay Area on Wednesday evening, according to the Council on American-Islamic Relations, Sacramento Valley (CAIR-SV). “This is the happiest day of my,” said Ali Hassan, Swileh’s husband, an American citizen. “Just last week I was about to pull him off life support … This will allow us to mourn in dignity,” he said in a statement. Swileh’s case prompted widespread outrage this week after reports surfaced that the young mother had been waiting for more than a year for a decision on a visa waiver. Swileh’s visa was rejected last year because of travel restrictions introduced in the so-called the “Muslim ban”, which bars individuals from several Muslim-majority countries from entering the US. 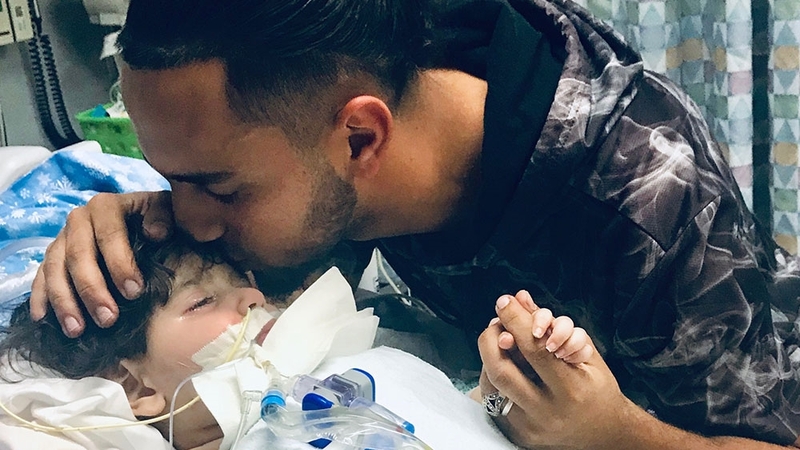 Hassan had previously said that he had requested that the Department of State expedite a decision on Swileh’s waiver so she could say goodbye to their son, Abdullah, who has a rare degenerative brain disease and may not survive much longer. On Monday, CAIR-SV filed an emergency federal lawsuit on behalf of the family. The suit alleged that the US embassy in Cairo, Egypt, where Swileh lives, purposely delayed a decision on her visa application until the travel ban went into effect. US authorities then told Swileh that she had been denied due to the ban. “This case is the perfect example of how the waiver process is a sham,” said Jennifer Nimer, one of the family’s attorneys. “The lawsuit filed yesterday clearly details for the court how the embassy callously ignored over 28 desperate pleas for help from the family over the past year and even the expedite requests filed by the prior attorney which contained medical documentation showing that the child was on the verge of death,” she added in a statement. A spokesman for the State Department told Al Jazeera that the department cannot discuss the details of individual cases, but “makes every effort to facilitate legitimate travel to international visitors”. Swileh and Hassan met and married in Yemen, according to the San Francisco Chronicle. Their son was born in Yemen, nearly two years after the country’s ongoing civil war erupted in 2015. The conflict has killed tens of thousands and pushed the impoverished country to the verge of famine, prompting the United Nations to call the situation there “the world’s worst humanitarian crisis”. Rights groups and a war monitor have put the death toll at more than 60,000. Swileh left Yemen for Egypt when Abdullah was eight months old. Hassan met her in Cairo and obtained travel documents for his son from the US embassy, the Chronicle said. He was forced to leave Swileh and travel to his hometown of Stockton, California, because of Abdullah’s deteriorating condition. In addition to nationals of Yemen, the most recent version of US President Donald Trump’s travel ban prohibits entry to the US by most people from Iran, Libya, Somalia and Syria. It also affects visitors from North Korea and some travellers from Venezuela.